This is one of the beers I've been most excited about in ages. 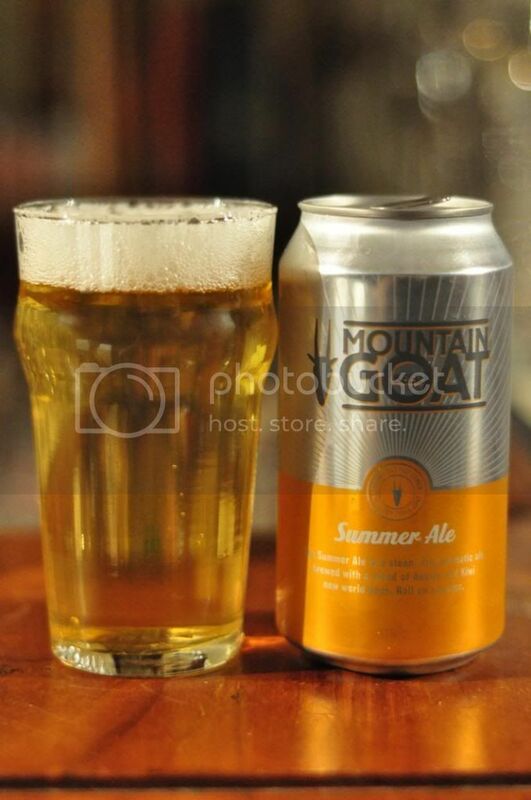 Mountain Goat's Summer Ale. They've canned it ostensibly so that the brewers have something to bring to Meredith Music Festival. Seems like as good an idea as any! 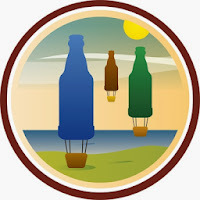 So the Summer Fun badge is a pretty easy on to get, or so I thought. It's taken me a very long time to acquire it. All you have to do to get this badge is have 3 beers with the wood "Summer" in the name. My three; Mikkeller's Vesterbro Summer Pale Ale (at the Mikkeller bar in Copenhagen), Hix Summer Ale (at the brewery in Dromana) and now this beer Mountain Goat Summer Ale (in my bar). I've had a few of these but this is actually the first one I've poured into a glass. The beer itself is a very light yellow colour with a wispy white head. As the picture shows quite well the head was rather short lived, with a number of large bubbles causing it to dissipate quickly without leaving a trace of lacing. That being said, although the beer looks almost lagerish I doubt this will put many off as it's not a beer many will pour into a glass. The nose is jammed packed full of tropical fruit flavours, and they are strong! It's just a beautiful crisp nose, that totally belies that it looks like a lager! I could go into specifics on this nose but I'd be here all day, this is one you need to smell to understand. Mountain Goat Summer Ale tastes just like it smells. There is plenty of fruit flavours from the hops, however very little bitterness appears to have been imparted. The other thing that I've taken away from drinking these is how dry this beer is. It's a great example of the Australian Summer Ale. I love this beer! It's going to be one of my favourite beers this summer. The nose alone is worth buying this beer for. I think that the Summer Ale could, and maybe should, be a style in it's own right. This one is excellent, it's refreshing as any I've come across, the flavour is excellent and it's almost bone dry! What more could you ask for? If you see this one around guys, grab as many as you can! You won't regret it.